Every season I find that there are a few items in my closet that I keep coming back to. It's always stuff that is easy to throw on and that is comfy and most of the time it is very basic. Now the flannel shirt, jean jacket, and striped sweater aren't the exact things that I'm rocking as they are no longer available for purchase. And the converse? I haven't been able to find them anywhere so I don't think they make them anymore. It's a shame because I love them so and I would like to replace them whenever I wear them out, and I definitely will. The skinny jeans from PacSun are my favorite pants I've owned in a long time. They are high rise and they are so dark they look pretty nice! Dress 'em up, dress 'em down. My Minnetonka boots... I. Love. Them. So. That tee is pretty basic even though it has words on it and it is made of the softest material. And those socks up there are men's socks but I don't care. I've been buying these socks from American Eagle for years. They are warm and cute when they peek out at the top of yer boots. Anyways, these are my current fall essentials. But come winter, I'm sure things will have changed a little. 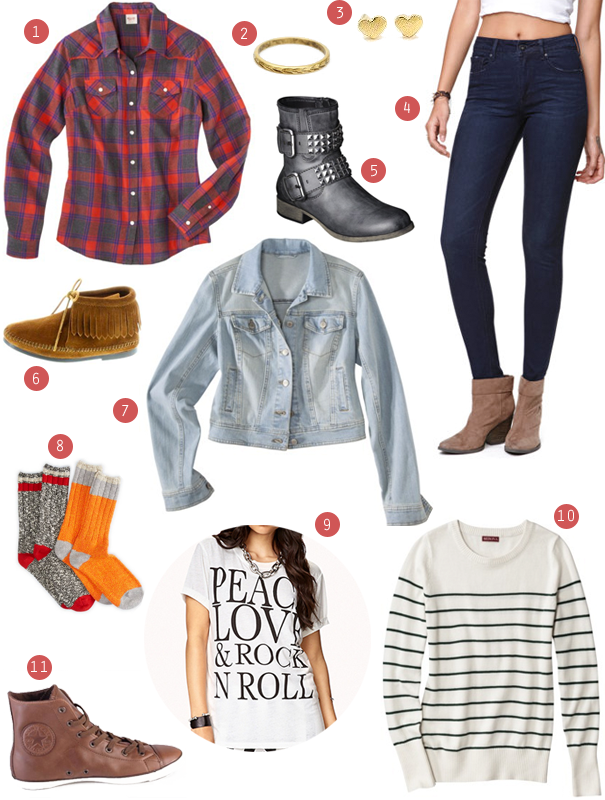 What are your fall essentials?